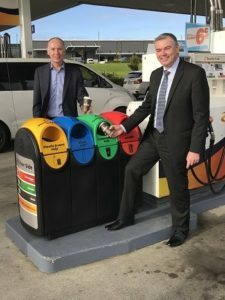 Z Energy is installing new forecourt recycling facilities at 117 of its retail sites with a grant of $218,000 from the Government’s Waste Minimisation Fund. Associate Environment Minister Scott Simpson announced the new initiative at a pilot forecourt on Highbrook Drive in East Tamaki last Friday. “Z Energy has developed a modular forecourt bin comprised of separate compartments for waste, glass, plastic and cans, and Z compostable coffee cups,” Mr Simpson said. Trial bins are being piloted at three Z Energy Sites in Auckland with more to be rolled out around the country later this year. “Z Energy has made a commitment to promote sustainability by using less and wasting less within their business,” he said. The Waste Minimisation Fund was established in 2009 and is funded by a levy of $10 per tonne charged on waste disposed of at landfills. The fund’s purpose is to boost New Zealand’s performance in waste minimisation, by reducing waste and increasing the recovery of useful resources from waste. More than $80 million has been awarded to more than 130 projects to date. Next articleParting words from Winston Peters at the Grey Power AGM.